Newmarket Glass Mobile does repairs! We make house calls. Newmarket Glass Mobile specializes in residential repairs. From single putty window repairs to thermal pane replacement. In order to give you an accurate price for your repairs, we need to come out to your residence. Not all windows are the same. Mutton bars, low E energy efficient and argon gas filled can affect the price. We also have to know if it is outside or inside glazing as well as first or second floor. With that in mind, we charge a $50 upfront deposit for size and estimating. If you are looking for a ball park figure, email us the approximate size and we can give you a rough idea by email. Please keep in mind that your quote by email may not be 100% accurate. 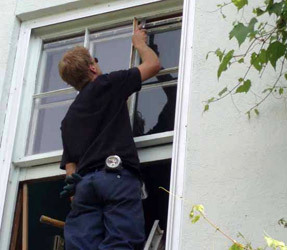 Once we come out and determine what type of window you have, then we can firm up the price. We can supply & install a wide range of commercial framing such as store fronts and vestibules. Please email us proper blue prints for quoting.